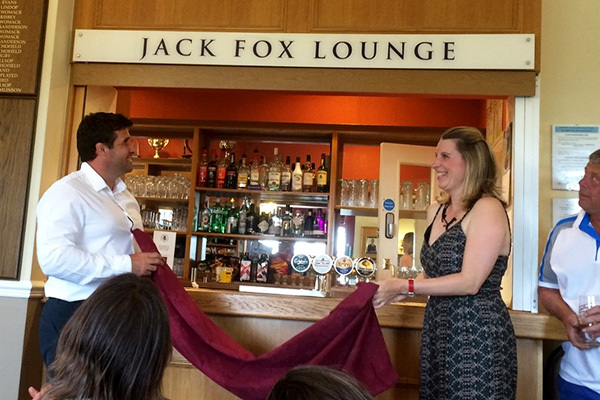 On Saturday the 23rd June the large members bar was officially named “The Jack Fox Lounge” in recognition of services to Normanton Golf Club by our past President who sadly passed away in December last year. Members of Jack’s family spread his ashes near the first tee before retiring to the clubhouse with other club members and friends to share a drink and memories of Jack. Our Captain, Mr Dean Mountain, spoke briefly on behalf of the club reiterating the impact Jack had upon Normanton Golf Club and the affection felt for him amongst our membership before inviting Jack’s children, Lisa and Stephen to unveil the new signage. “We have been overwhelmed by the love and support shown to us by Dad’s friends at the golf club since he passed away. Hatfeild Hall was such a special place for Dad and he would have been delighted with the Jack Fox lounge. Thank you to everyone who came to the opening, if was lovely to chat to people and share memories of Dad”.